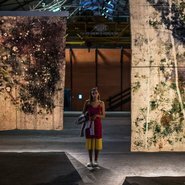 This month we will explore the work of emerging contemporary Australian artists at Carriageworks; one of three cultural venues showcasing The National 2019: New Australian Art . Gitte Weise will guide participants through the work of artists such as Tony Albert, Cherine Fahd and Sean Rafferty. Image: photo by Ellie Lauritsen.